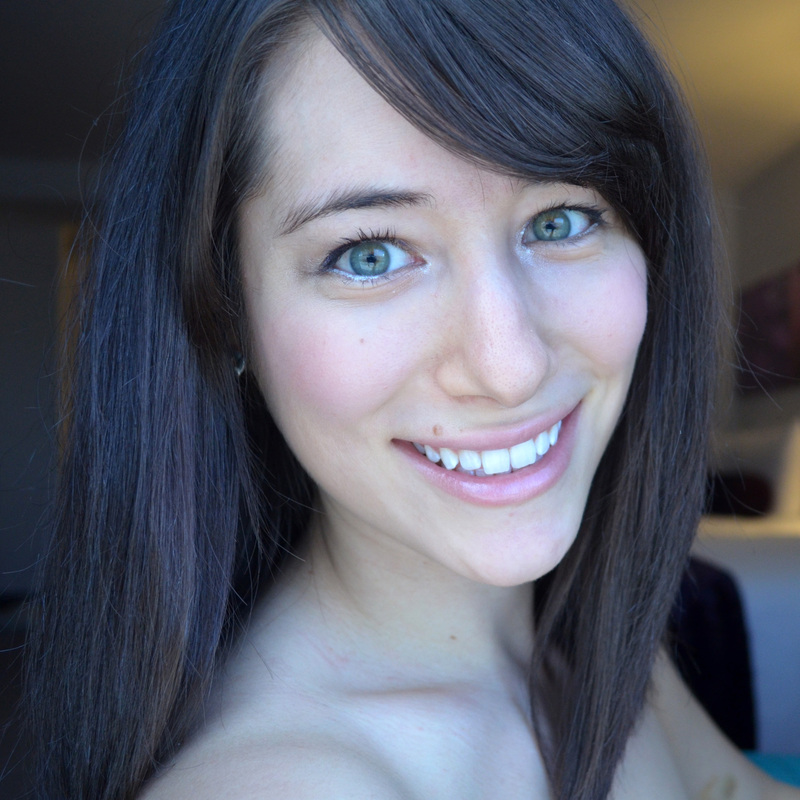 Weekend Recap: Pole Training and My First Aerial Hoop Class! Happy Hump Day! Just wanted to quickly recap my fun-filled weekend (even though it’s already Wednesday) of pole training and falling in love with a new aerial apparatus! Before I recap, if you haven’t already, check out my first giveaway! I will be giving away one $50 dollar Lululemon gift certificate to a randomly selected person. The giveaway is open until the end of the month so make sure you enter before I choose a winner on December 1st! Saturday was a great pole day! Since it is “Opposite Side November” I focused a lot on my “bad side.” I’ve noticed that my inverts on my opposite side have gotten so much better over the course of this month. The chronic pain I’ve been experiencing on the right side of my back has diminished since I’m not favoring one side during my training. I also worked on my ayeshas (split, cup and twisted grip) and a couple leg variations. I’m still struggling with getting my ayeshas on my opposite side, mainly because my push pull grip doesn’t feel quite right when my left hand is on top, but I’m hoping that I’ll figure it out soon. 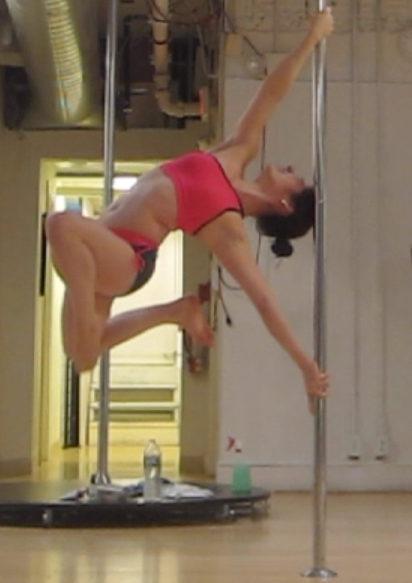 Twisted grip ayesha leg variation – my goal is to get both legs to bend in that direction! Another one of my goals is deadlifting into my ayesha. It is much harder and requires a great deal of arm and core strength to lift up into that position without momentum. Right now I can only lift my legs up a little bit and I’m struggling with trying to lift my hips up…which means I need to add more core-heavy conditioning exercises into my weekly training. At the end of class, my friend Lindsey and I took a picture of our double straight edge with our awesome muscle leggings by Black Milk! I know some people will be grossed out by these leggings but I think they are super cool. I have also have their lightning leggings, which are great too. Black Milk’s leggings are made out of a high quality material and they are very durable so check them out – they have all kinds of funky prints. Check out the video below of a mini combo I did at the end of my first aerial hoop class! Adwords. Anyway I’m adding this RSS to my email and could look out for much more of your respective fascinating content. Usually I do not read article on blogs, however I would like to say that this write-up very compelled me to take a look at and do it! followers on Instagram. According to a study conducted by social media monitoring service Reppler, 91% of employers use social media channels such as Twitter, Facebook, and Linked – In to screen prospective employees. the cellular soil may understand possibly even build-up software with the help of sibling benefit. and sources back to your blog? My website is in the very same area of interest as yours and my visitors would truly benefit from some of the information you provide here. thing you need to understand, but assuredly understand them you must, if you want your business to thrive. “As many as three out of four women have uterine fibroids, but most are unaware of them because they often cause no symptoms. There are also women whose symptoms returned five years after the procedure was done. Discussed below are some major advantages of MRI guided HIFU, a latest therapy to treat uterine fibroids :. cards, player bios, and intermediary design elements. If you want to improve your know-how just keep visiting this website and be updated with the most up-to-date news posted here. a taboo subject but typically people don’t discuss such topics. If you wish for to grow your know-how just keep visiting this site and be updated with the latest gossip posted here. blog loads extremely fast for me on Opera. Excellent Blog! and produce the best results for almost anyone who adopts this kind of mentality. There are so many fruitful nutrients found in seaweed which contribute partially to weight loss. search results. I’m sure that your low rankings are caused by hi bounce rate. pages will end up, so having reasonably low bounce rate is important for increasing your rankings naturally. After the presentation, brochures that are accurate and appealing can be made available in the nurse’s office or other public area for others to take.